With a sleek design, remote control, light-up track projector, and jaw-dropping backflips and wheelies, this Thomas and Friends Turbo Flip Thomas Remote Control Vehicle from Fisher-Price delivers fun-filled stunts like you've never seen before! Be a part of the Thomas & Friends experience by controlling Thomas and all his cool tricks. Even though Sir Topham Hatt hasn't seen these daring moves yet, Thomas is ready to share them with a very special friend like you! Ages 3 and up. Requires 4x "AA" (LR6) alkaline batteries (included) and 2x "AAA" (LR03) alkaline batteries (Not included). Assembly required. Ages 3 and up. For the first time ever, Thomas does a backflip, and he looks cooler than ever with a sleek high-velocity design! 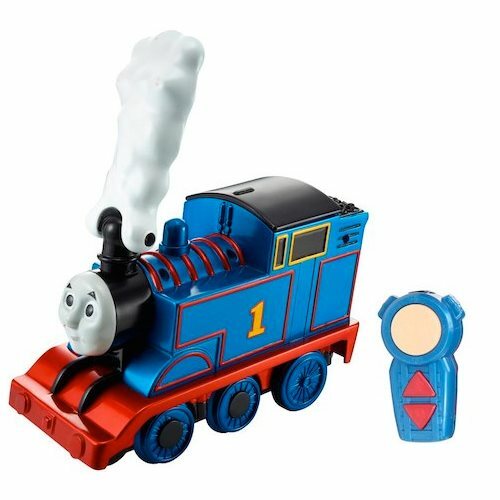 The remote control lets kids make Thomas do wheelies and backflips, plus send him racing forward or speeding backward. Push the "1" on the side of Thomas to watch him do a preprogrammed sequence of stunts. The unique light-up track projector makes it look like Thomas is racing on the rails as he moves forward, and the sounds and phrases complement Thomas' array of tricks. And much more!